There's more than just fossil shark teeth! Because sharks are made of cartilage and not bone, it's a common misconception that teeth are the only parts that fossilize. 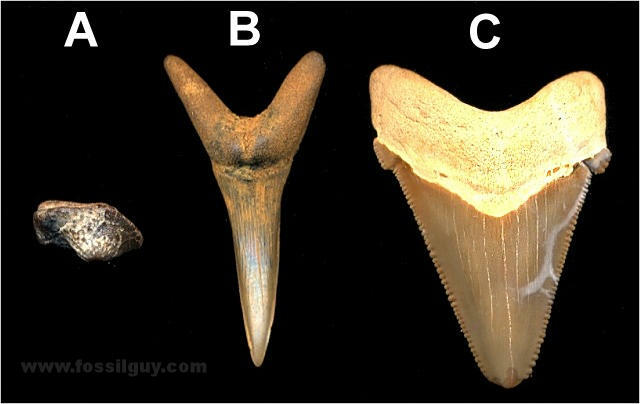 Although shark teeth are by far the most common fossils, many other parts of sharks fossilize. 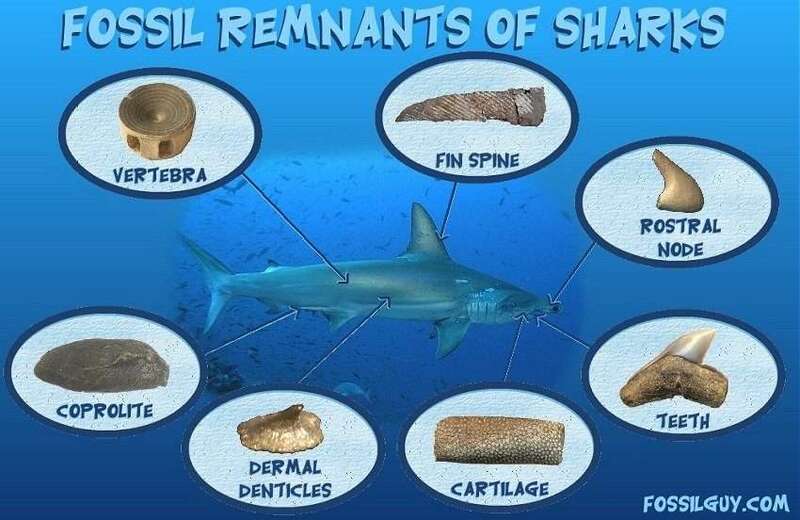 Other parts that can fossilize are the areas of denser cartilage, such as the centers of the vertebra, jaw cartilage, and the rostral node in a shark's snout. The skin of a shark is made of tiny denticles, which are made of the same enamel that teeth have, meaning they too can fossilize. Some sharks have spines in their fins that will fossilize. Finally, shark feces, or coprolites, are sometimes found preserved. This article serves as an introduction to all of those parts of a shark that can fossilize. 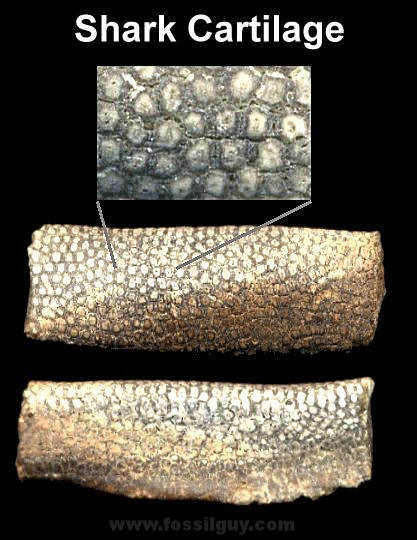 Fossil Shark Teeth - What are shark teeth made of anyhow? Shark teeth are the most common type of fossil for a number of reasons. 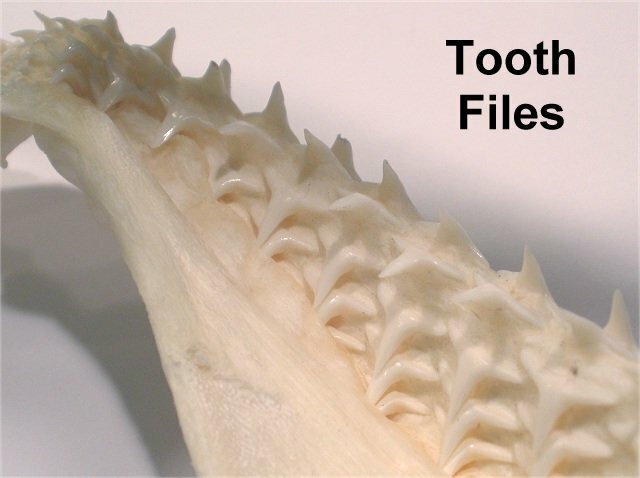 First, shark teeth, like most teeth, are made of dentin, a hard calcified tissue that does not easily decompose. Dentin is harder and denser than bone. In a tooth, the Dentin is surrounded by a very hard enamel shell. Secondly, to maintain a sharp smile, shark teeth are designed to regularly fall out and be replaced. This is shown in figure 1. If a shark has 40 or 50 teeth in its front dentition, and that dentition is replaced every few weeks, it takes no leap in logic to realize a shark can go through tens of thousands of teeth in a lifetime. Different estimates for different sharks range anywhere from 25,000 to 50,000 teeth lost in a lifetime. Now multiply that by millions of generations of sharks over tens of millions of years, and presto, shark teeth are the most common fossil. Figure 1: This picture shows the inside jaw of a Charcharhinus sp. shark. Notice the numerous rows of teeth waiting to replace the front teeth in this shark jaw. Shark teeth can be categorized into three general shapes: crushing, grasping, and cutting. Crushing teeth are short and round. These are designed for crushing mollusk shells and crustaceans. Grasping teeth are long and pointy; ideal for grasping fleshy fish. Cutting teeth are usually triangular in shape and have serrations, like a steak knife, and are designed for cutting through bone and taking chunks out of large prey. Figure 2 shows the general tooth shapes. Figure 2: This image shows the three general tooth shapes. Tooth A is a crushing tooth from Ptychodus sp .found near Sherman, TX. Tooth B is a grasping tooth from Scapanorynchus texanus found near Holmdel, NJ. Tooth C is a cutting tooth from Carcharocles. Teeth can also be categorized by their position in the jaw, with the general positions being either anterior, lateral, or posterior. The anterior teeth are the front few teeth, the laterals are the teeth along the side of the jaw, and the posteriors are teeth toward the rear of the jaw. Each tooth in these positions can look very different from one another. Additionally, shark teeth can look different between male and female sharks of the same species, from juveniles to adults of the same species, and finally they look different if they are in the upper jaw vs. lower jaw. Some of these differences are illustrated in figure 3. 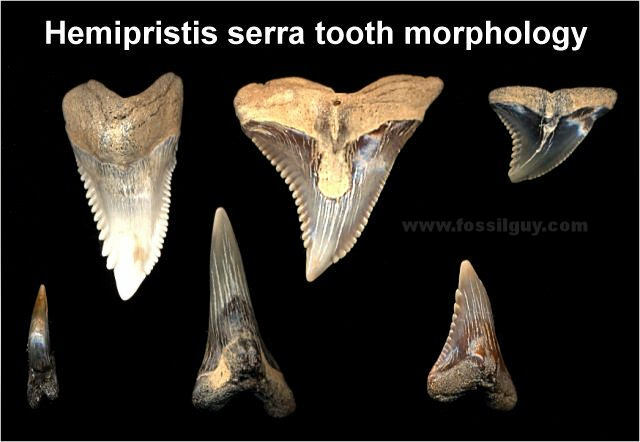 Throw all of this together and an isolated fossil tooth can be nearly impossible to determine which species of shark the tooth came from. 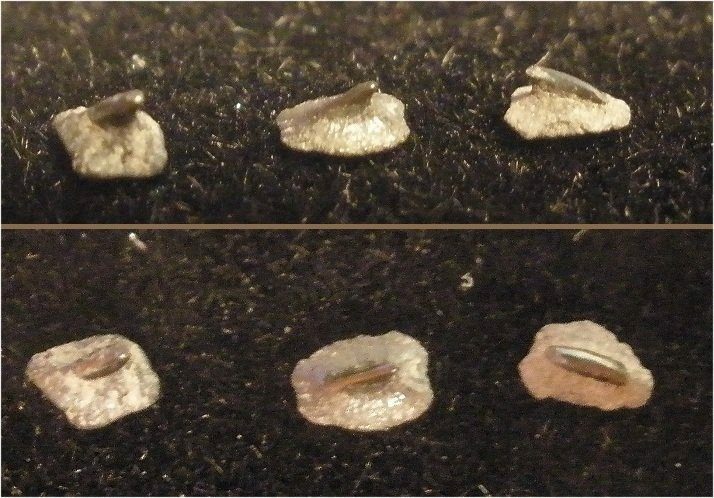 Figure 3: This image shows Hemipristis serra teeth from the Calvert Cliffs of MD. The three top ones are upper teeth, and the three bottom ones are lower teeth. From left to right, there is an anterior, lateral, and posterior. Notice the difference in tooth shape between upper and lower jaws and different jaw positions. Notice Hemipristis has an upper dentition designed for cutting, and a lower dentition designed for grasping. Shark skeletons are composed of cartilage. Cartilage, the stuff your ears and nose are made of, is much softer than bone, and rarely survives fossilization. Because of this, entire fossilized skeletons of sharks are, generally, a rare find. The vertebral centra (centers of vertebra) are the densest part of the shark skeleton and sometimes fossilize. Vertebral centra are disk shaped. Processes would have come out of the large grooves in the sides of the centra, but they almost always do not survive fossilization. Vertebra centra range dramatically in size. Centra from a baby shark may only be 1/8" in size, while C. megalodon centra may be around 5 or 6 inches in size. Refer to figure 4 for examples of shark vertebral centra. Figure 4: This image shows sample shark vertebra. The leftmost one is from near Summerville, SC. Notice the left one has lots of "bridges" or septa running through the disk This is indicative of Lamniform sharks. The right two vertebra are from the Calvert Cliffs of MD. Notice how they are more solid looking. The vertebra processes would have come out of the elongated holes in the centra. Although shark cartilage, aside from the vertebra, is unlikely to fossilize, the cartilage in the jaw of a shark tends to fossilize more often than other types of cartilage. This fossilized shark cartilage is often found as fragmentary chunks, and therefore can be almost any shape. However, the surface of the cartilage has a unique prismatic pattern making it unmistakable when found. Figure 5 shows a piece of shark cartilage. Figure 5: This image shows a piece of fossilized cartilage that is most likely from the jaw of a shark. Notice the prismatic like structure. This cartilage is about 1.5" (38mm) in length, and was found at the PCS mine in Aurora, NC. Dermal denticles are the scales on the shark's skin. Denticles give the skin of a shark a silky smooth texture when rubbed one way, but a sandpaper like texture when rubbed the other way. The streamlined denticles give the sharks a hydrodynamic advantage over other fish. They resemble miniature teeth, having a "root" like section, with an enamel tip sticking out. This part, made of bone, anchors the scale to the skin. Denticles are usually a millimeter or so in size, and are therefore often overlooked. 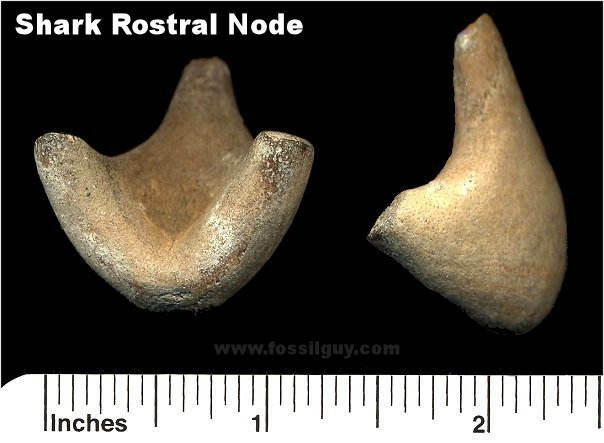 The Rostral node, or Rostral cartilage, gives shape to the snout of the shark. If one could pull the skin off of a shark head, just past the nasal capsule in the rostrum of the shark is a dense mass of rostral cartilage. While most rostral nodes are cone shaped, hammerhead have a more square shaped one, indicative of the scalloped shaped snout. Figure 7 shows a rostral node. Figure 7: This is a rostral node from a small shark. This specimen was found at Aurora, NC. Fin spines are just that, Spines on the leading edge of fins on certain sharks. Fin spines were more prevalent in early Paleozoic shark species, but are still found in primitive-looking sharks, such as the modern dogfish shark. Their purpose is most likely for deterring predators. Figure 8 shows a fin spine fragment. Figure 8: This is an image of a partial fin spine from an early Paleozoic shark called Ctenacanthus sp. Ctenacanthus fin spines have a unique comb-like pattern on them. This specimen is from a Devonian site called "Red Hill" near Hyner, PA.
Coprolite is the fancy term for poop. Shark coprolite comes in different shapes and sizes, but often has a spiral pattern on it from the shark intestinal tract where it was formed. Depending on the diet of the shark, there can sometimes be bone fragments in it. Although you wouldn't think poop would commonly fossilize there are some fossil layers in which coprolite is very common. 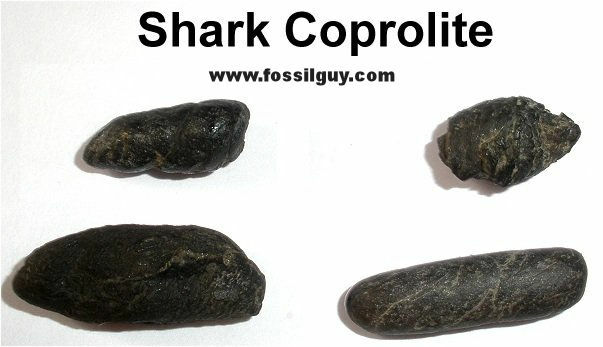 Figure 9 shows samples of shark coprolite. 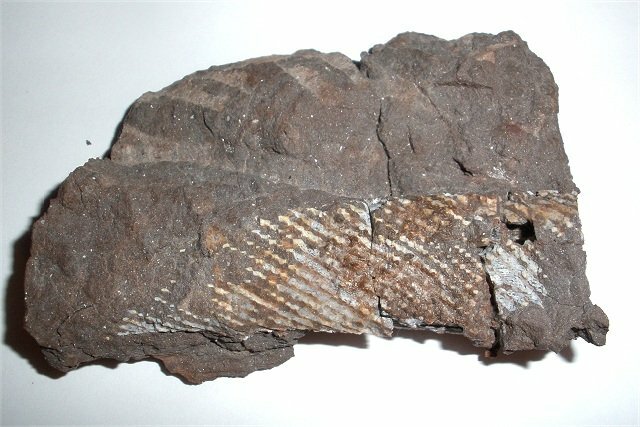 Figure 9: This image shows sample fossil shark coprolite. The largest one is ~1" (25 mm) in length. These samples are from the Nanjemoy Formation, at "Muddy Creek," VA. Hyner, PA. Although fossilized shark teeth are extremely abundant, and are often the only shark fossils collected. 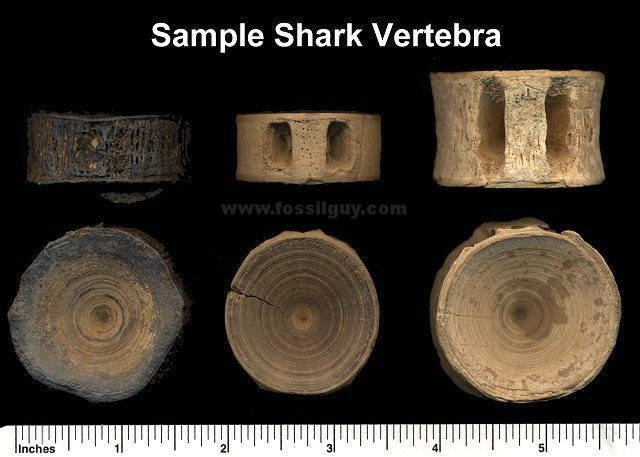 Remember, there are many other types of shark fossils to be discovered. So, the next time you are looking for fossil shark teeth, take a closer look at the sediments. Try to find some less common shark fossils. I know you are now dying to find a "Mr. Potato Head" looking shark nose, and some gross shark poop! The Origins and Evolution of Sharks.